As one of the biggest and best boat shows in the world, the Cannes Yachting Festival always has a dazzling array of tenders and dayboats to choose from, and this year’s line-up is no different… Our round-up starts with the new 13 metre dayboat from French yard Canados. 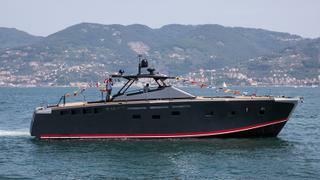 The 428 Gladiator was developed in collaboration with superyacht designer Marco Casali and was built to RINA A class standards. Engine options include Volvo Penta and Cummins set-ups and the most powerful promises a top speed in excess of 55 knots. 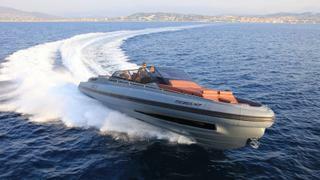 Our round-up starts with the new 13 metre dayboat from French yard Canados. The 428 Gladiator was developed in collaboration with superyacht designer Marco Casali and was built to RINA A class standards. Engine options include Volvo Penta and Cummins set-ups and the most powerful promises a top speed in excess of 55 knots. Having turned heads in 2015 with the worldwide debut of its transforming tender, Evo Yachts is back with a walkaround version that should be just as popular. 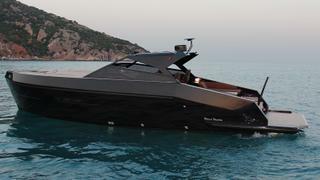 This 13 metre dayboat is similarly adept at morphing from sleek speedster to floating beach club, with expanding bulwarks and a fold-out transom. 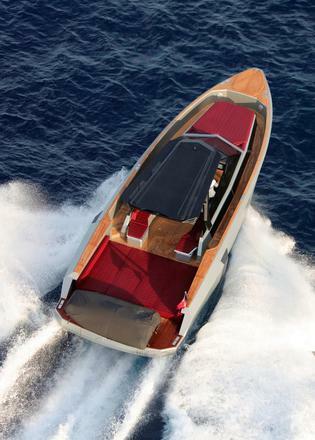 Austrian yard Frauscher is renowned for building fast and furious dayboats and the 1414 Demon is a great example. 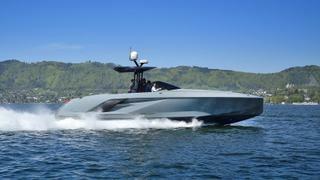 Earlier this year, a 2,200hp version was delivered having proved her top speed of 67 knots during a particularly spicy test drive. If you get a chance to take a ride in Cannes, don’t think twice. 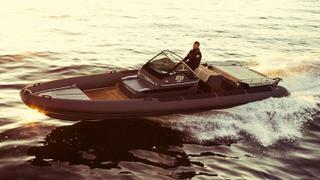 A mainstay of the sporty RIB market, Norwegian yard Goldfish is bringing its 29 Sport model to this year’s Cannes Yachting Festival. She has some serious heritage too, as she combines the seaworthiness of the Goldfish 29, which currently holds the record for fastest single-engined RIB to circumnavigate the British Isles, and the luxuriousness of the Norwegian Royal Tender — one of the yard’s most high-profile launches to date. 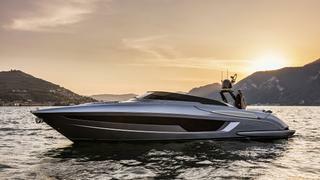 Getting a global premiere at the 2017 Cannes show, the Christian Grande-designed Invictus 240CX is a brand new 7.45 metre from the Italian yard that packs a lot of premium features into such a compact package. Highlights include an outdoor shower, foldable Bimini and up to 250hp worth of outboard power for a top speed of 38 knots. 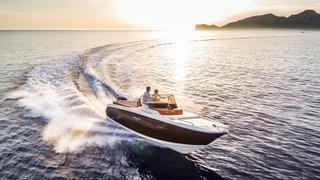 Turkish yard Mazu made its world debut at last year’s Cannes show with the Mazu 38 and this year they will be bringing a Soft Top version with them. Riding on the same 11.9 metre hull, this new arrival was delivered to her owner in St Tropez back in July and was customised to match the client’s love for Armani style. 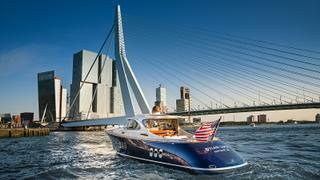 A top speed of 34 knots has been achieved thanks to her twin Volvo Penta IPS 400 engines. 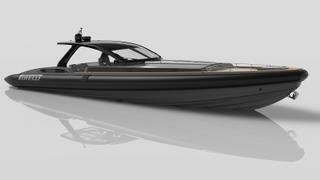 Tecnorib’s latest 1900 flagship RIB has been developed as part of Pirelli’s Design project, and as a result it is suitably luxurious and well thought out. 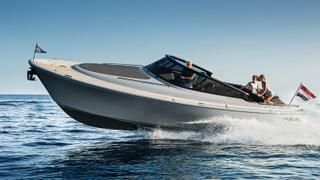 The whole idea was to build a boat with the sleek design features of a yacht but the sportiness of a RIB. 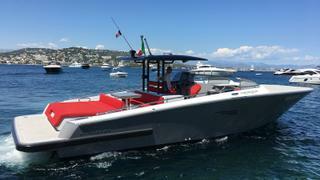 The 18.5 metre boat boasts a 2,000 litre fuel tank and two 800hp MAN i6 engines, which result in the Pirelli 1900 hitting an impressive max speed of 45 knots, and a cruising speed of 30 knots. The sun worship takes place on large sunpads on the bow and aft deck. And the Pirelli flourish? The tread pattern of the brand’s famous track-racing wet tyre is used on the tubes in “celebration of Pirelli’s expertise in... extremely wet conditions”. Yet another sleek sporty dayboat from the boards of Christian Grande DesignWorks, the Sacs Rebel 47 is sure to attract plenty of admiring glances at the Canes Yachting Festival 2017. Built to EC Category B, this 14.21 metre RIB can whisk up to 16 guests ashore in no time at all with a pair of 400hp Volvo Penta D6 engines churning out plenty of power. Hull number one in the new MV19 dayboat range from venerable Italian yard Baglietto, Ridoc will bring her military-inspired styling to Cannes this year. Launched back in June, this 19.5 metre all aluminium cruiser was built for a European client to a design by Francesco Paskowski. Moving inside, her Margherita Casprini décor uses Canaletto nut upholstery to create a retro allure. It’s been an emotional year for Italian dayboat icon Riva, after the passing of the great Carlo Riva, but his legacy lives on in this new 17 metre, which will be given the red carpet treatment in Cannes. Styled by Officina Italiana Design, the new Rivale is very much a pocket superyacht with high-gloss mahogany panelling and soft furnishings by Ivano Redaelli and Van Besouw. With Mercedes-Benz style and a gleaming silver finish, there’s certainly no mistaking the Silver Arrows 460GT, which will be gracing this year’s Cannes Yachting Festival. A whole host of big names from the superyacht world worked on this 14.2 metre project from Martin Francis to Tommaso Spadolini and Van Oossanen Naval Architects. And with the recent news that Finnish yard Baltic Yachts will be putting the prototype into production, we can expect to see a lot more of the 460GT in the future. Much sought after on both sides of the Atlantic, the 16.48 metre Van Dutch 55 is one of the most popular models in the Dutch yard’s range. 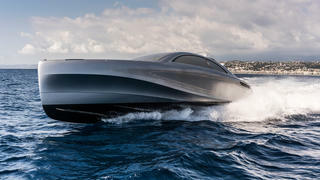 Frank Mulder’s naval architecture expertise allows this sleek speedster to hit speeds of up to 37 knots with a pair of 900hp Volvo engines installed. Another Dutch yard hoping to make a big impression at this year’s Cannes Yachting Festival is Wajer Yachts, which is bringing its curvaceous 11.3 metre Wajer 38. Developed in collaboration with naval architecture firm Vripack, this 45-knot speed machine has been turning heads ever since it was first introduced back in 2013. 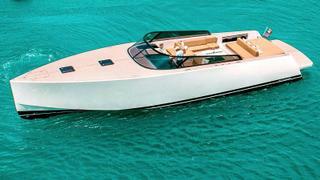 The 16.95 metre Zeelander 55 will be getting its European debut at Cannes this year. The classic exterior lines come courtesy of Dutch superyacht designer Cor D Rover, while the smartly conceived interior can welcome up to ten guests for a meal in the fully enclosed wheelhouse — and the Seakeeper stabilisation system ensures you won’t need to worry about spilling your drink. What’s more, clients can choose to work with Sinot Exclusive Yacht Design to customise the on-board décor.